Cater Phoenix moves from DIY to BANG! 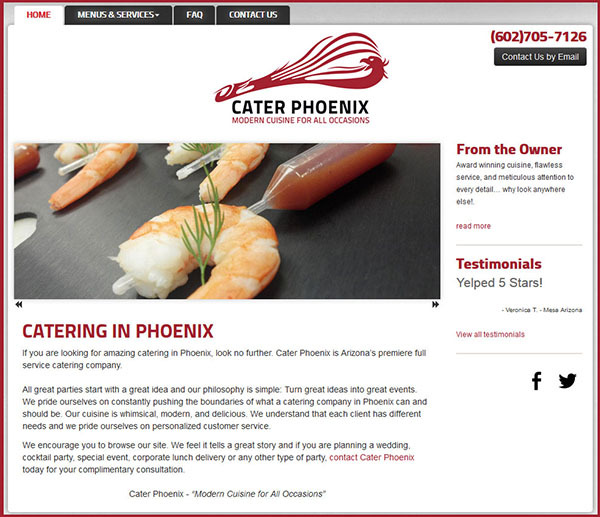 Cater Phoenix (www.CaterPhoenix.com) was looking for a website redesign that would showcase their amazing cuisine and food catering services in Phoenix to prospective clients. We took their underperforming DIY (Do It Yourself) site and turned it into a lead generation machine! The sites great search rankings have resulted in their phone ringing off the hook for their catering services. Dennis came to us with a Flash powered WIX site that was Invisible to search engines and unusable on mobile devices (because of the Flash technology). Although he liked the look of the site, the lack of lead generation was discouraging and ultimately made the site nearly useless. Our solution: We rebuilt the site using our CMS (Content Management System) that still allowed Dennis the ability to make site updates and we solved his invisibility issue with search engines by optimizing his site using SEO(Search Engine Optimization) techniques. We also included our photo gallery/slide show system on his site giving Dennis the freedom to upload images of his delicious creations to visually stimulate site visitors. Results: Within 2-3 months, Cater Phoenix was ranking on Google, Yahoo & Bing! search engines for multiple keyword phases and in 6 months' time the site had multiple keyword phrases ranked on page 1 of the results. Although the site was not optimized for mobile (Dennis's choice), visitors can still easily access the site on mobile devices. Most important result is that his phone started ringing and the contact us page on the site lit up! "BANG! took my DIY (Do It Yourself) Web site that was invisible to search engines and useless on mobile devices to a highly ranked lead generation machine! I have had days where the phone would not stop ringing for wedding catering requests. All because of BANG! 's Guaranteed Measurable Results!" If your catering website isn't putting clients on your calendar, contact BANG! for a website guaranteed to perform.